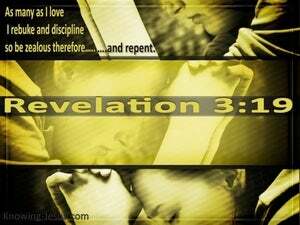 ﻿ Revelation 3:19 'Those whom I love, I reprove and discipline; therefore be zealous and repent. I correct and discipline those whom I love, so be serious and repent! As many as I love, I rebuke and chasten. Be zealous therefore, and repent. Those whom I [dearly and tenderly] love, I tell their faults and convict and convince and reprove and chasten [I discipline and instruct them]. So be enthusiastic and in earnest and burning with zeal and repent [changing your mind and attitude]. "I rebuke and discipline those I love, so be earnest and repent. As many as I love, I rebuke and chasten; be zealous, therefore, and repent. Those whom I love, I rebuke and chasten. So be zealous and repent. as many as I love, I rebuke and chastise: be warm therefore with zeal, and repent. As many as I love, I reprove and correct; therefore, be zealous, and reform. So many as I love, I rebuke and chastise; be zealous, and repent. I reprove and discipline all whom I love. So be earnest and repent. Whomsoever I love, I rebuke and chasten: be zealous and repent. As many as I love, I rebuke and chasten; be zealous therefore, and repent. I, if as many as I love, I rebuke and correct: be emulous therefore, and repent. As many as I love, I reprove and discipline. Be zealous, therefore, and repent! As many as I love, I rebuke and chasten; therefore be zealous and repent. As many as I love, I rebuke and chasten. Be fervent therefore and repent. I reprove and discipline those whom I love; so be in warm earnest and repent. All whom I love I reprove and discipline; therefore be full of zeal and repent. 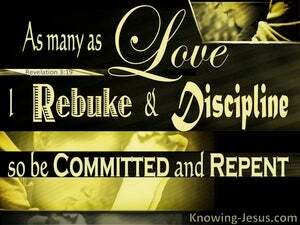 As many as I love, I rebuke and discipline. Be zealous therefore, and repent. As many as I love, I rebuke and chasten; be zealous therefore and change your minds. I, as many as I tenderly love, I convict and put under discipline: be zealous, therefore, and repent. As many as I love, I rebuke and correct: be zealous then, and repent. 'All whom I love I rebuke and discipline.' Therefore be in earnest and repent. The people whom I dearly love, I always reprove and discipline. So keep on being earnest and once for all repent. As many as I love, I reprove and chasten. Be zealous, therefore, and repent. Whomsoever I love, I reprove and chasten: be zealous therefore and repent. 18 I advise you to buy from Me gold refined by fire so that you may become rich, and white garments so that you may clothe yourself, and that the shame of your nakedness will not be revealed; and eye salve to anoint your eyes so that you may see. 19 'Those whom I love, I reprove and discipline; therefore be zealous and repent. 20 'Behold, I stand at the door and knock; if anyone hears My voice and opens the door, I will come in to him and will dine with him, and he with Me.